At this point we collect newspaper and magazine articles which have been published about HUBERTUS. If available we added an additional PDF-file at the end of each article. In each case there is an approval of the publisher. 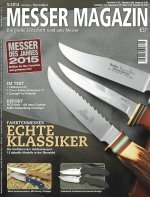 In the knife-journal MESSER MAGAZIN 1/2015 12 current models of switchblade knives ("Springer") are presented. Our HUBERTUS model 69.120.HH.11 is also present and represents the traditional version! The book comprises 224 pages, is excellently layoutet und illustrated with a large number of historical and coloured illustrations. We are very glad and thank Stefan Schmalhaus for considering our multi-part Westphalian’s Nobility Knife as a traditional gentleman pocket knife. Till now the book is only available in German language. The journal MESSER MAGAZIN presents 15 different models of gentlemen knives in its issue 6/2014. We are very glad to announce that with a knife from our Westphalian’s Nobility Knife-series HUBERTUS is also present in the article. As one of the cover stories if the current issue of MESSER MAGAZIN the journal presents current models of scounting knives in a synopsis an 10 pages. 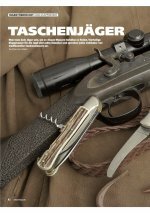 The knife-journal Messer Magazin published in its issues of 4/2013 a 10-page article about hunting knives. 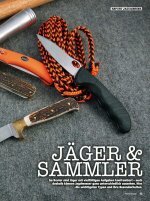 In the MESSER-KATALOG 2013 - a special publication of the well-known German knife-magazine MESSER MAGAZIN - current and revised products of the national and the international knife-scene are presented. This time we are represented on 3 pages with 18 knives. 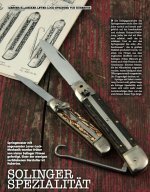 The German "Messer Magazin" reports in its issue of 1/2013 about switchblade knives ("Springer") with a lever-lock-mechanism and in particular about those manufactured by HUBERTUS. The professional journal Messer Magazin published a two-page company portrait of HUBERTUS in its "Messer Katalog 2008" ("Knife Catalog 2008"). In its issue 2/2007 the journal Messer Magazin published an eight-page article on folding hunting knives also dealing with our HUBERTUS knives.We are glad to present it below.